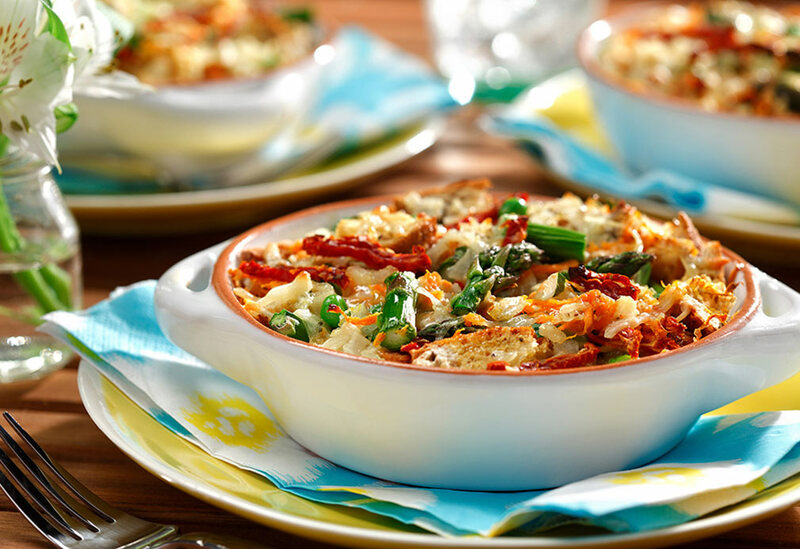 This stunning dish is like a savory bread pudding studded with colorful, spring vegetables and full of rich flavor. By using canola oil and a mix of whole eggs and egg whites, you get the sumptuous flavor of most breakfast bakes without the saturated fat. This dish makes entertaining a breeze since you prepare it the night before. In the morning, just pop it in the oven, then relax and enjoy your guests. 1. In large nonstick skillet, heat canola oil over medium-high heat. Add onion and cook, stirring, until softened, about 3 minutes. Add garlic and continue to cook for 1 minute more. Add asparagus and cook, stirring occasionally, until just beginning to soften, about 1 minute. Stir in peas, remove from heat and set aside. 2. Coat 9 x 13-inch (22 x 33-cm) baking dish with canola oil cooking spray. Arrange bread cubes over bottom. In large bowl, beat whole eggs, egg whites, milk and mustard together until blended. Add vegetable mixture, both cheeses, carrot, sun-dried tomatoes, tarragon, salt and pepper, stirring to incorporate. Pour mixture over bread, making sure liquid saturates bread. Cover with plastic wrap and refrigerate overnight or at least 8 hours. 3. Remove strata from refrigerator, uncover and allow to sit at room temperature while you preheat oven to 350 °F (180 °C). (Do not keep at room temperature for more than 20 minutes.) Bake until set and top forms golden brown crust, 70-80 minutes.